Crunchy Fish Parmesan Recipe? Not chicken? Yes, and it is delicious. Extra crunchy crust on the fish fillet topped with homemade sauce, melted cheese and bedded on a plate of buttered noodles. Use your favorite fish for this recipe. Meanwhile, beat eggs in a bowl and set aside. Mix the panko crumbs with the 1/2 cup Parmesan cheese in another bowl and set aside. Place the fish fillets on paper plates. Salt and pepper the first side and sprinkle with flour. Turn over and repeat. Dip flour-covered fillets in the egg mixture and then press into the panko mixture on both sides. Make sure it's coated well. Place on a foil-covered baking sheet. Repeat with the remaining fillets. Let rest on foil for 15 minutes or so; this keeps the breading from falling off when frying. PREHEAT oven to 450 degrees (please see note below). Heat the oil in a cast iron or heavy frying pan on medium-high. Test with a flick of water to be sure it's hot. Place one or two fillets in the hot oil and fry for 2 minutes on each side until golden brown. It will finish cooking in the oven. Place the fish fillets in a baking dish sprayed with oil and cover with tomato sauce. You may use more sauce on the pasta, but I just like it on the fish fillets only. Next, layer each fillet with equal amounts of mozzarella and provolone cheese. To make the crunch: Sprinkle the Parmesan cheese equally on top of the fillets and drizzle with the olive oil. Bake in the oven until the fillets easily flake with a fork. It will only take a few minutes. Serve: Place buttered noodles on plate and top with fillet. Serve with garlic bread and a tossed salad. 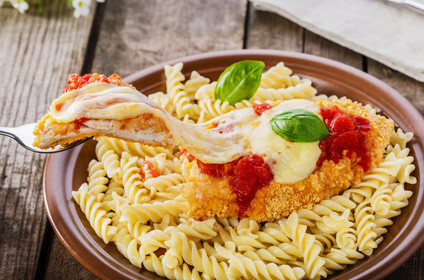 NOTE: If the smaller fish fillets are almost cooked through when you fry them, just use the broiler in the oven to melt the cheese on the top. The sauce will already by hot. You also may deep-fry the fish until completely cooked. Just place under the broiler at the end to melt the cheese. This is wonderful also. **Shrimp would work well also, just deep-fry and top with tomato sauce, cheese and broil to melt.